Episode 2: Cast on ALL the Things!!!! WARNING: This is a very fangirlish episode, as we talk about Nathan Fillion, Kristen Bell and Ian Sommerhalder! Also, Val apologizes in advance as she was sick with a head cold at the recording of this episode. She tried not to snuffle and wheeze too much for our listeners! There’s a paneled jury, marketplace, classes and more! Lots of guests, comics, gaming, table-top gaming and cosplay competition! See the website for admission prices and guest list! Sci-Fi, Comics, Horror, Anime, Gaming and Cosplay! 52 Weeks of Dishcloths – On the KnitPicks Blog! One new washcloth to knit or crochet for every week of the year! Val is most definitely participating, check out the one she made for me! Valerie is working on the edging of the baby blanket for her friend in the States who had a little baby boy! She can’t wait to send it out to her friend so her little guy can enjoy it! And on the washcloth addiction list, she’s cast on a Round Lacy Dishcloth using Bernat Handicrafter Cotton in Smokey Wine. 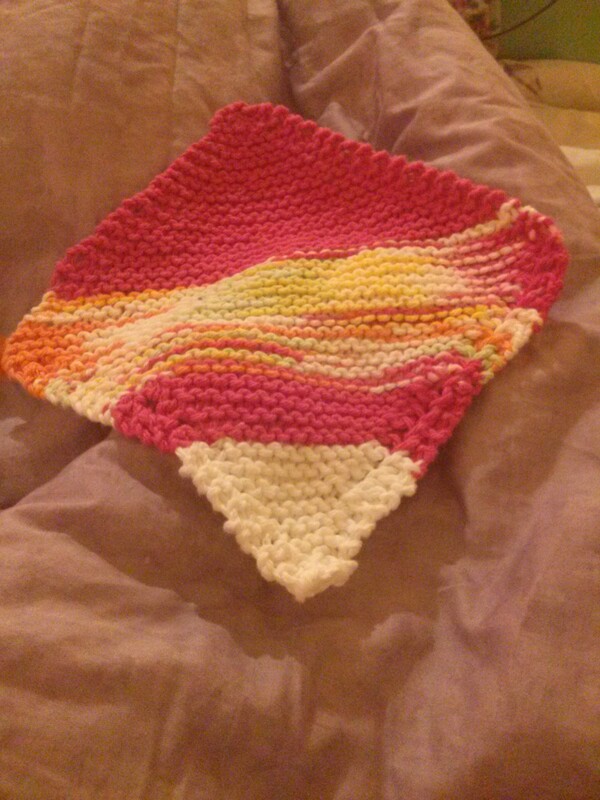 It’s a knitted dishcloth and it’s turning out so nicely. Katy is working on … too much! LOL First she had a pair of Stitch Surfer Socks by Louise Robert from Knitty. She’s knitting it out of Must Stash Yarn in the Colourway Elsa and Anna (from Frozen! eeeee!) and the yarn is just gorgeous. 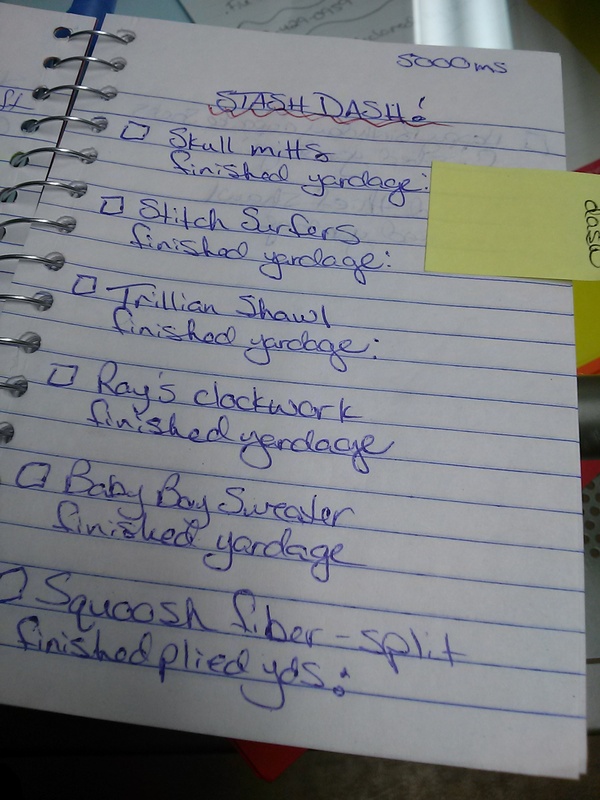 The Stitch Surfers are a little intimidating to look at, but Diane of the Knitabulls Podcast has some great tutorials! Also on the needles is the Trillian Shawl by Martina Behm and the yarn is ‘Girlfriend’ from Yarnloft by Elysia on Etsy! The colours are fantastic and it is a nice bouncy yarn, perfect for the garter stitch and Martina’s patterns are so potato-chippy and it’s perfect for mindless tv knitting. 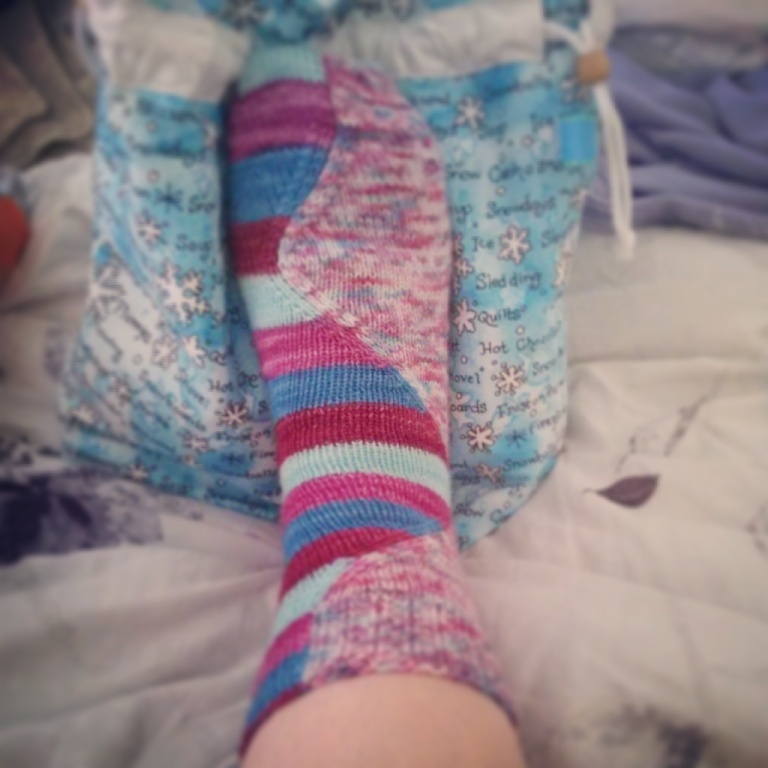 Katy also has a pair of Afterthought Heel Socks by Laura Linneman, which is a free pattern on Ravelry. 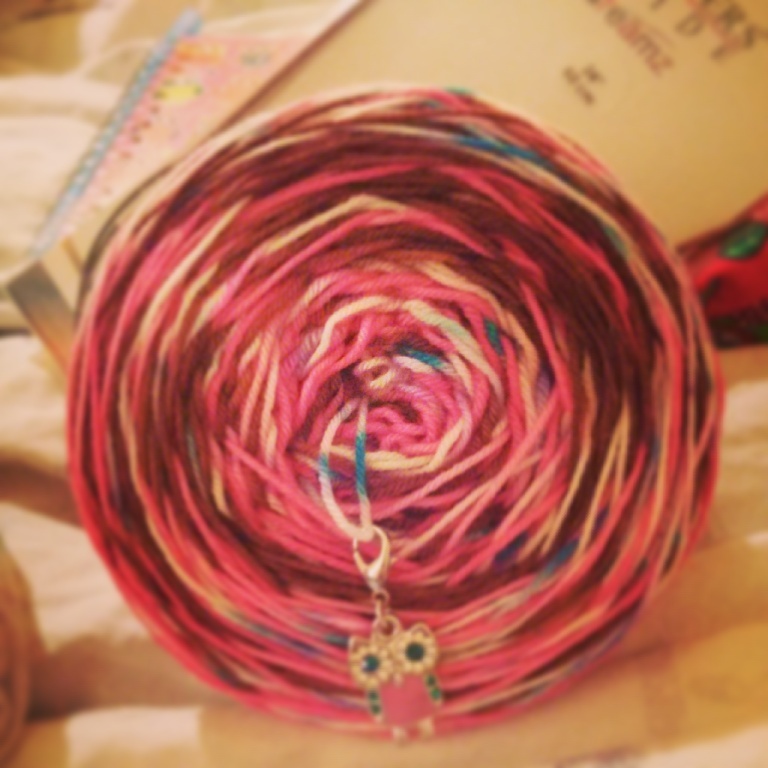 The yarn is ‘Happy Birthday Cupcake’ from Desert Vista Dyeworks. She is going to do a true afterthought heel… which means cutting the yarn (eek!)! But all will work out we’re sure! 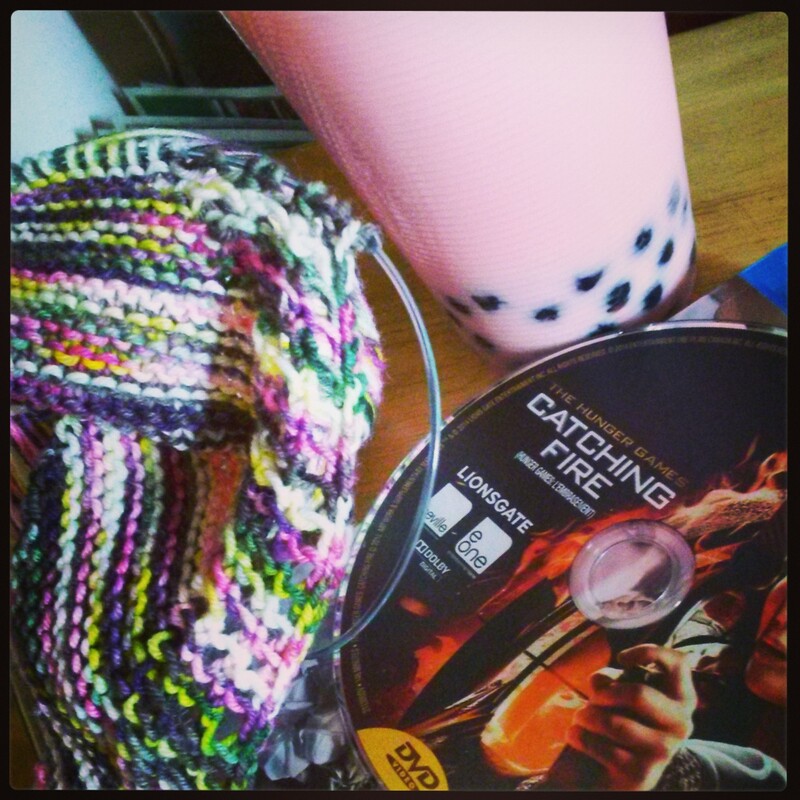 And the last thing on the needles, in another Sherlock bag from Bag End Bags on Etsy, is the Orchid Thief Shawl by Ysolda Teague. 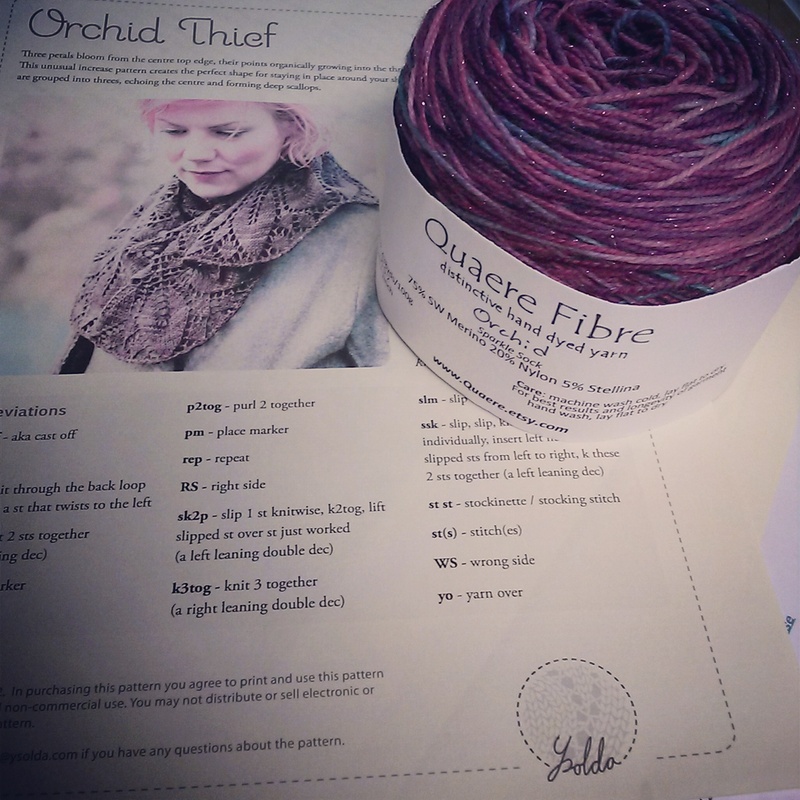 This shawl is gorgeous and the yarn she’s using is ‘Orchid’ from Quaere Fibres on Etsy in her sparkle sock base! 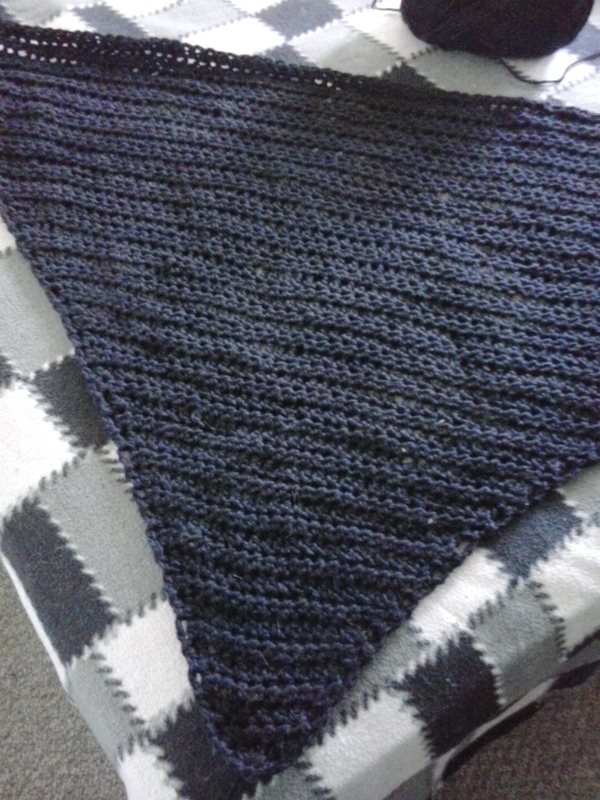 It’s beautiful and this shawl is more special because Katy is knitting this with her Mom and Val!!! We got our needles from China!!! They are very nice and comparable to the Ciao Goo Red needles with the nylon coated cable and stainless steel needles. 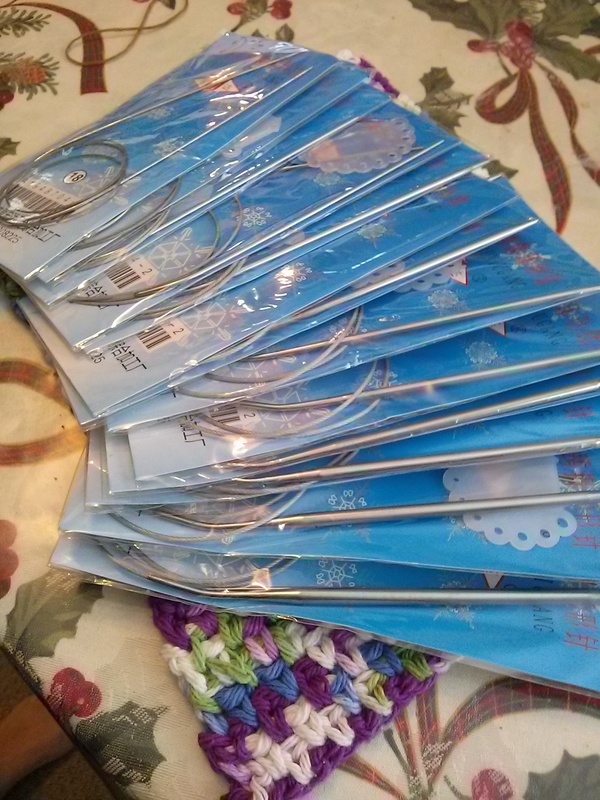 The tips aren’t as sharp as the Ciao Goo needles, but they are very nice and smooth and have the bend near the cable join to make them more ergonomic and easier on your hands. Katy got her Desert Vista Dyeworks order in and it contained ‘Happy Birthday Cupcake’ and ‘Solid Chocolate Zombunny’ both in her Viso base! 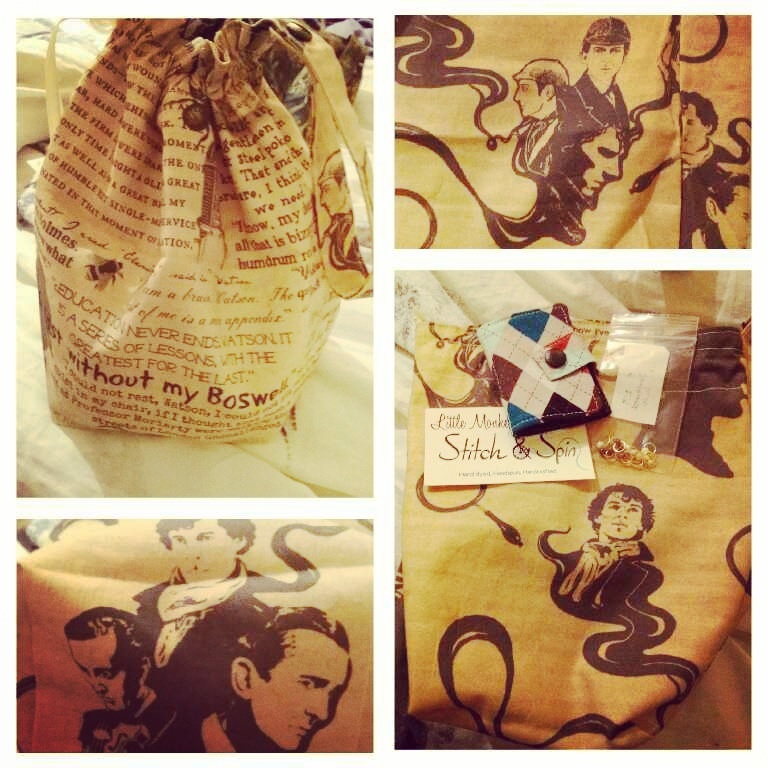 And the most awesome Sherlock Holmes bag from Little Monkey Stitch N’ Spin on Etsy! It’s gorgeous, and Katy is a super fan of Sherlock Holmes and all three actors; Basil Rathbone, Jeremy Brett and Benedict Cumberbatch are portrayed on the one side, and on the other is quotes from the books with pics of bees, beehives, fleur de lis, and pictures of Sherlock Holmes himself. The bag is nice and fits a pair of socks easily and it has a strap with a snap on it so you can attach it to your purse, bag or even your wrist and it has a secure drawstring closure! She also included a few freebies!!! Thank you so much! 😀 Katy is also enjoying the mini snag free stitch markers in Southwest that she ordered to match the bag 🙂 They fit up to a 3.75mm/US5 needle. 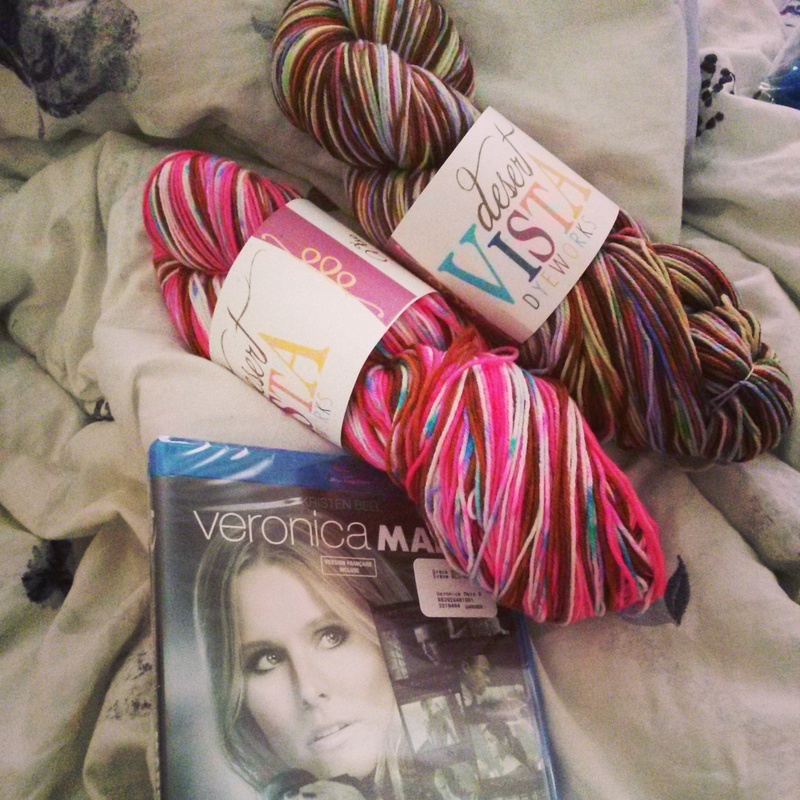 Val received from Katy a little gift of two Bernant Handicrafter Cotton yarn skeins in Ahoy Ombre and Love. 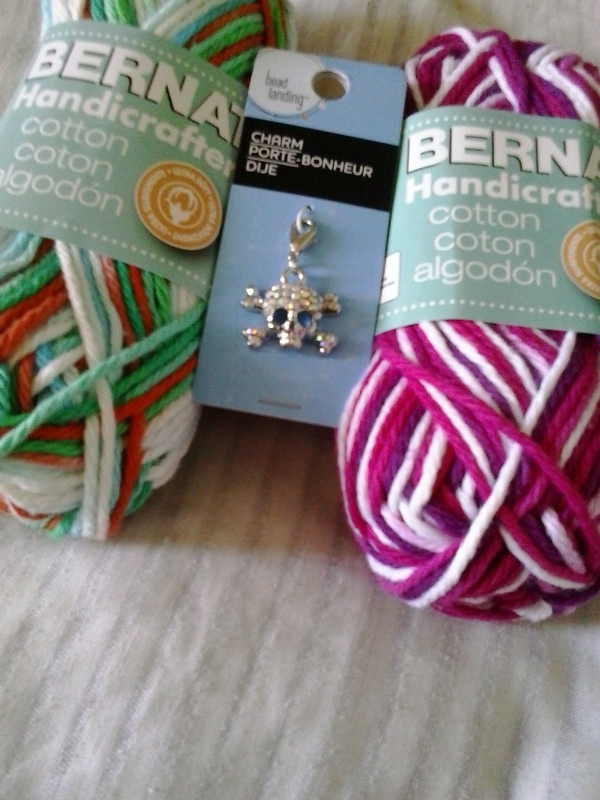 As well, Katy gave her a little stitch marker that is a skull and cross bones blinged out with little rhinestones. Valerie is watching Game of Thrones on HBO, she intends on watching the HBO Movie, Normal Heart and she has just started watching The Vampire Diaries on Netflix (and is in love with Damon Salvatore but don’t tell her husband). She also watched the season 2 finale of Hannibal (on NBC) and can report it was bloody and full of cliffhangers. Katy is watching 24: Live Another Day (she totally blames Miss Karen from the Knit 1 Geek 2 Podcast for getting her hooked on 24) every Monday night and you can find seasons 1-8 on Netflix (Val has a lot of catching up to do! ), Wild Things with Dominic Monaghan on the Discovery Channel on Tuesday nights and she got to watch the Veronica Mars movie… which did not disappoint…she implores for anyone to bring it back to TV!!! You can catch Seasons 1-3 of Veronica Mars on Netflix as well. As always, we hope everyone has a great week and if you have any questions or comments, please feel free to do so, and check out The Stitch Sisters Podcast group on Ravelry! Great podcast. I really enjoyed it. We’re working on submitting it to itunes, we’ll let you know asap when we have a downloadable link 🙂 xo Katy thanks so much for listening!! !